IHS finds PC distributors hold the smallest levels of inventory among all players in the PC supply chain, carrying just 30 days’ worth of stockpiles in the fourth quarter, primarily consisting of completed computers. Original design manufacturers (ODMs) held the second smallest levels of inventory among all players in the PC supply chain, carrying just 32 days of inventory (DOI) of computers. ODMs account for the vast majority of mobile PCs produced worldwide every year. The figure below presents DOI held by the various segments of the PC supply chain in the fourth quarter on average during the previous six years. The DOI measure in this figure applies to the goods and subcomponents manufactured by each industry. For example, for semiconductor suppliers, this means chips and integrated circuits; for PC distributors and ODMs, it applies to complete computers. Aside from rising risk, the business model used by PC ODMs and distributors lends itself to maintaining low inventory levels. PC manufacturers and distributors are likely to only have stock that can move quickly to the consumer. Shelf life is short for computers given that PC models change frequently, so it becomes undesirable to keep finished goods for any length of time. And for PC distributors in particular, inventory needs to come in and then go straight out as quickly as possible, which partly explains why they have the smallest DOI of all participants in the PC technology chain. 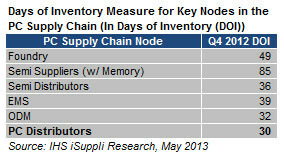 Semiconductor suppliers possessed the largest amount of inventory in the PC supply chain in the fourth quarter. From the fourth quarter, semiconductor suppliers held the greatest amount of stockpiles at 85 days on average. Semiconductor manufacturers are able to keep a greater amount of inventory—in the form of raw materials, work-in-progress or finished goods—as these items are much lower in cost on absolute terms than other products being made further down the supply chain. In general, semi manufacturers need to have on hand a certain amount of raw materials to be more nimble and adjust quickly to demand for end customers. Even work-in-progress and finished goods can be redirected toward other customers should demand change during the manufacturing cycle, as parts can be re-marked for a different requirement that fits within device specifications. In contrast to the PC and contract manufacturing nodes, foundry suppliers can be more flexible with their store of stockpiles, an advantage that allows them to hold a larger amount of inventory and redirect toward demand if needed. Among semiconductor suppliers, companies with a stronger market share in discrete and analog technologies are more comfortable in holding a larger-than-average DOI. This is due to predominance in their product portfolio of catalog devices such as high-volume commodities, which tend to possess a longer shelf life.